This is an english product from 1950s. The axis of the gramophone was the driver. Tape recorders has built for studios at the beginning, and these were very expensive machines. Few people could allow it for home use. But the magnetic technology was a chance for the commercial marketing. There was the intention: introduce everybody to this technology. If you have a gramophone before, you can put the Adapter the top of the gramophone. You can listen in, and you can record from the radio, from the gramophone, and your voice with a microphone. 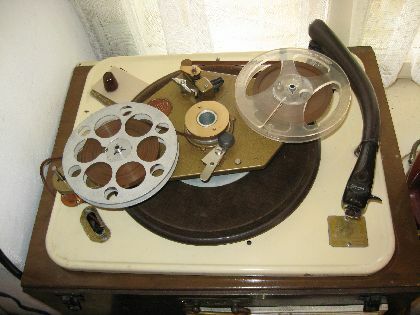 A cheaper solution was born, and the magnetic tape recorder came into general use.